UPON COMPLETION OF THE PROTEIN DEFINITION, THE NEXT SERIES OF INPUTS INCLUDES INFORMATION RELATED TO THE EXPERIMENT SETUP. THIS IS ACCOMPLISHED VIA A WIZARD-BASED TOOL. THE USER PROVIDES THE EXPERIMENT INPUT PARAMETERS AND THE SOFTWARE BUILDS THE TEMPLATE FOR THE EXPERIMENT. AT THIS STAGE INSTRUMENT *.RAW FILES ARE ASSOCIATED WITH EACH TIME POINT REPLICATE USING A DRAG AND DROP INTERFACE. ONCE THIS IS COMPLETED THE USER ENTERS PARAMETERS FOR INITIAL DETECTION OF PEPTIDES WITHIN THE H2O CONTROL DATA FILES. THE PEPTIDE DETECTION ALGORITHM HAS BEEN DEVELOPED OVER MANY YEARS, AND IS PRIMARILY BASED ON THE COMPARISON BETWEEN THE THEORETICAL AND EXPERIMENTAL ISOTOPIC DISTRIBUTIONS. 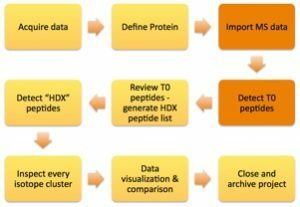 IT HAS BEEN CUSTOMIZED TO LEVERAGE HIGH RESOLUTION DATA AND IS ABLE TO MAKE CORRECT IDENTIFICATIONS IN COMPLEX SITUATIONS SUCH AS OVERLAPPING PEPTIDES OR LOW S/N.